During its 45-day campaign, Meridian bagpack, the world’s first convertible messenger bag and backpack, raised more than $85k on the crowdfunding platform. Hillside Industries is happy to launch the Meridian bagpack as the stylish, functional solution to make carrying personal belongings easier than ever. The Meridian bagpack, the world’s first instantly convertible messenger bag from Hillside Industries, has continued to accept pre-orders on Indiegogo’s InDemand platform following a successful crowdfunding campaign on Kickstarter. Supported by 543 backers, the Meridian bagpack raised more than $85k and will ship to consumers this summer. Meridian’s continuous-strap system can be adjusted to sit on one shoulder or evenly distribute weight across both shoulders to reduce back and shoulder strain. Designed to auto-balance weight between both shoulders, the Meridian bagpack creates a floating effect, which prevents “jerking” from left to right when running or walking. Its patented continuous-strap design makes retrieving items from the bag possible without ever taking the bag off. The Meridian bagpack boasts plenty of storage: an outer zippered pocket, a laptop pocket and an inner compartment with five inner pockets. Meridian is carry-on ready and the neoprene laptop sleeve makes getting through TSA a breeze. It also weighs less than three pounds. 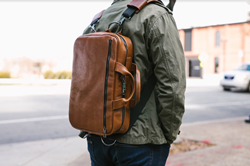 Starting at $115, and available in graphite poly coated nylon, full-grain brown leather and full-grain black leather, the Meridian bagpack eliminates the daily struggle of finding things in a hurry and transitions perfectly to fit any journey. To pre-order, visit pr.go2.fund/meridian. Developed in California, Hillside Industries is inspired by adventure and driven by technology. The company creates high-performance products constructed from state-of-the-art materials and components designed to meet the demands of the modern traveler. Hillside’s products are engineered to adjust to your dynamic movements and environments. To learn more, visit https://discoverhillside.com/.